This is my current Biodiesel production setup. I collect the oil in the “Used Veggie Oil” container. When I have 200 liters, I pump the oil into the reactor. Then I pump 40 Liters of Methanol in the white container (top left) and add the KOH (all done outside). 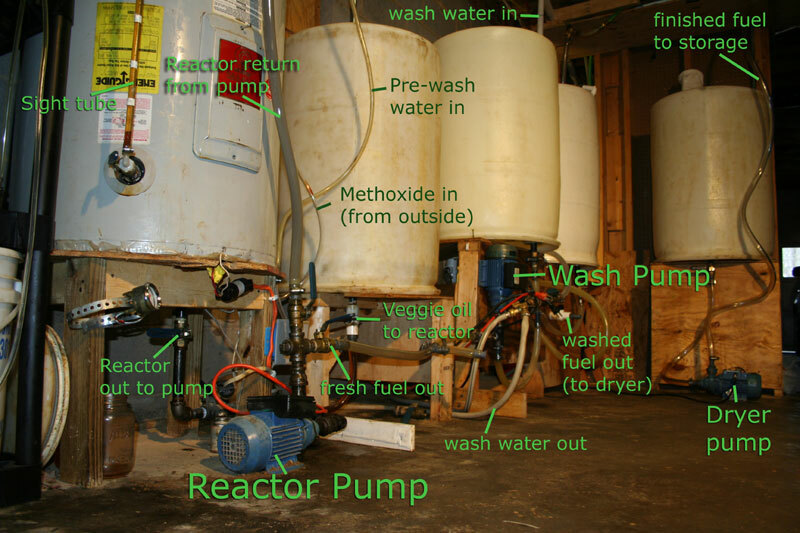 I install the methoxide container on the outside of the basement and connect it to the reactor with a hose. I insert the vent hose into the Methoxide container, so the methanol fumes bubble through the cool methanol. 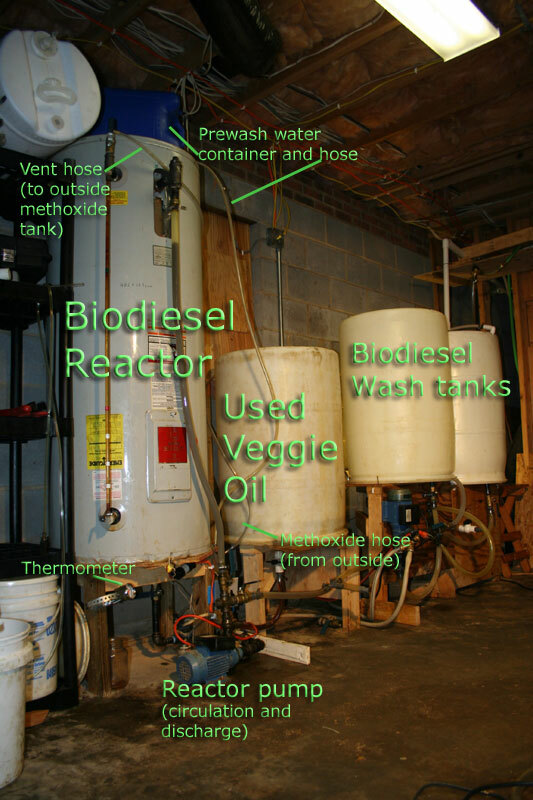 Then I crank up the biodiesel powered generator and use the electricity it produces to heat the oil. When the oil reaches 130 Deg. F, I add the methoxide, slowly, over 30 Minutes. Then the I let the circulation pump run for 6-8 hours for the reaction to do its thing. After that, I add 13 liters of water for the prewash (blue container on top of the reactor). I let that circulate for an hour, then I turn every thing off and let the batch settle. After a day or two, I pump out the glycerol, and then the fresh fuel. The glycerol gets stored and eventually composted. The fresh fuel gets pumped into the wash tanks, where I spray water on it, then bubble wash it, until it’s clean. Then I pump the washed fuel into the drying tank, where it gets dried and filtered. The finished fuel is pumped into the storage drum in the garage next door, and from there I pump it onto the cars.